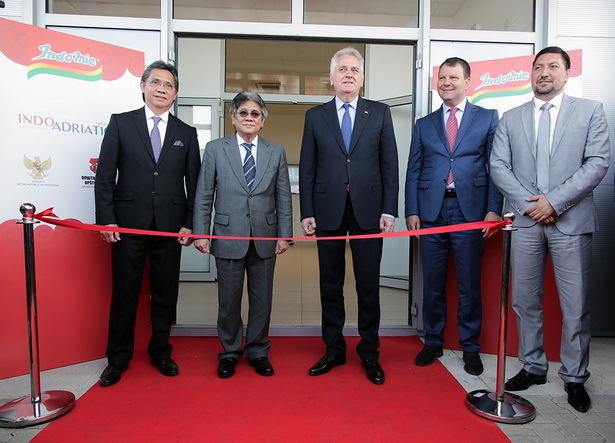 The President of the Republic of Serbia Tomislav Nikolić and the President of the company "Indofood" Anton Salim have opened factory for the production of instant noodles in ribbon cutting ceremony. The opening ceremony was also attended by the president of The Provincial Government Igor Mirović, The Ambassador of Indonesia to Serbia Hari Richard James Kandu and the mayor of Indjija Vladimir Gak. President Nikolić said that the opening of the factory was very important for Indjija, but also for Serbia too, because it represented an opportunity for development of Serbia. Not only employees but also suppliers of „Indofood“ and farmers will have benefits from the opening of the factory. "The first important effects for the Serbian economy are already visible, because in the process of construction of this plant a large number of local companies, suppliers of raw and technical materials and a significant number of constraction and assembly workers were involved. The factory building process has by itself created jobs for domestic workers," President Nikolić said. President Mirović said that he was very happy that the company „Indofood“ had chosen Serbia and Vojvodina for its investment whose value exceeds 11 million euros, because, as he pointed out, Serbia is really the best place to invest in this part of Europe. "We will be successful only if we come to the point that all municipalities in Vojvodina have at least one such large investor," president Mirović said. The mayor of Indjija Vladimir Gak thanked to the representatives of the Indonesian company because they have decided to invest in the municipality of Indjija, he has also said he hopes that idea of ​​opening the Indonesian working zone in Indjija will be achievable. Mr. Gak expressed satisfaction that over 100 workers from Indjija will find a job in the first stage and pointed out that the local government would provide all support to "Indofood" to expand its work and employ more people. "I am happy for my citizens that they will have the opportunity to work in a factory that becomes the center of Europe for supplying and exporting instant noodles. I am sure that many Indonesian companies will follow the path of "Indofood" and town of Indjija will do everything to make investors feel welcome in our community," said Mr. Gak. At the opening ceremony, The Ambassador of Indonesia to Serbia Harry Richard James Kandu and the President of the company "Indofood" Anton Salim also spoke about the significance of this investment. The company "Indofood" is the largest producer of instant noodles in the world, the investment in Indjija factory has been 11 millions of euros and it is the first investment of an Indonesian company in Serbia but also in Europe too.